My journey into 12c continues with the use of identity columns, this time regarding data that had been imported from another database, but sequences haven't been updated. Ensuring the next number returned from a sequence matches the current value from the table appears to be a common problem, my thoughts are described here. The biggest trouble is linking up the sequence to the column so we could automate the process. The next insert will be problem free, and we don't need to do anything else. 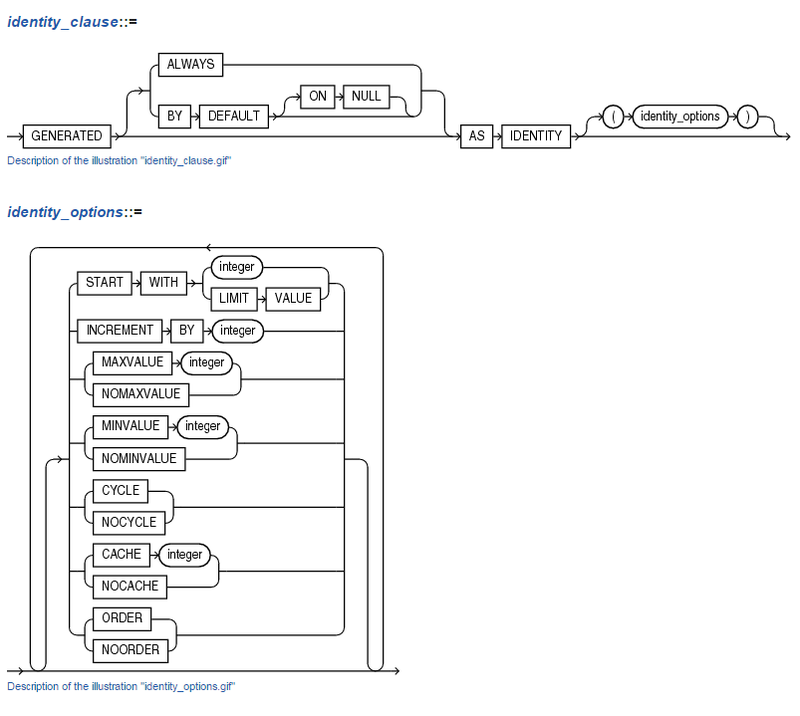 Identity columns use a sequence under the hood, as hinted in the statement diagrams for the create table syntax. I thought perhaps I could use my old technique on these sequences, but I forgot where to look for the name of the sequence associated with the identity column. However it turns out if you try to apply alter sequence to those generated by the system from the table DDL, you get the following error. So to increment the sequence beyond the most recent ID, I could make a bunch of requests to the next value of the sequence. This might be considered un-elegant, a dirty way to fix the problem. We're on 12c, surely there's a better way. The sequence creation is built into the DDL, so why not maintenance? Check out the help for the ALTER TABLE command. START WITH LIMIT VALUE, which is specific to identity_options, can only be used with ALTER TABLE MODIFY. If you specify START WITH LIMIT VALUE, then Oracle Database locks the table and finds the maximum identity column value in the table (for increasing sequences) or the minimum identity column value (for decreasing sequences) and assigns the value as the sequence generator's high water mark. The next value returned by the sequence generator will be the high water mark + INCREMENT BY integer for increasing sequences, or the high water mark - INCREMENT BY integer for decreasing sequences. Now illustrate this in action. So it seems we can throw away that old reset_seq.sql file? Particularly if the replacement is now an ALTER TABLE command that doesn't need to know about any values. In comments the optional definition settings I find most useful, which would have been defined within the table DDL. If Oracle can manage by IDs with sequences and do all the grunt work for me, go right ahead. Often dynamic sql that stings us!